On Monday, January 13, we drove to the home of our good friends Lauren & Tom Rankin in East Greenwich, RI, then on to JFK for a 5:40 am flight to Miami. After 2.5 hours in Miami, we arrived at Hewanorra-Vieux Fort airport at the southern end of St. Lucia at 3:35 pm. It was a long day but we were all in a lovely, warm place. 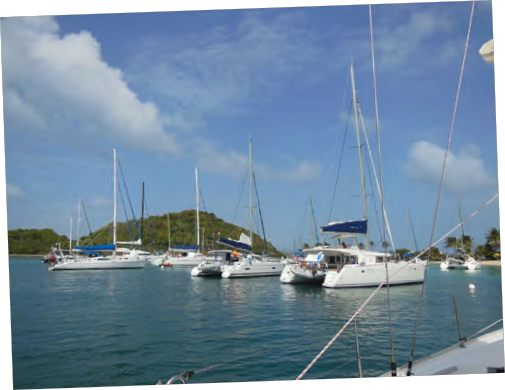 We arrived at the Sunsail/Moorings base in Rodney Bay at the northwest corner of the island at 7 pm, and were met by the base manager and shown to our boat, Skoolzout. On Wednesday morning, Andel from SunSail delivered the chart briefing. 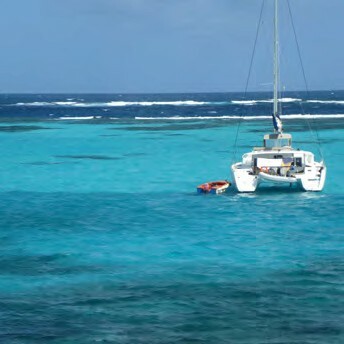 He noted that at the famous Les Pitons, where we planned to sail, we should plan to use a mooring, as the water is very deep, and we should also try to get there before 2 pm. Plan B would be to go further north to Soufriere and radio on VHF 16 for either Benny or ranger Peter to help us anchor. Andel also said to remember to change flags when we crossed into St. Vincent, and not to stop at the harbors on the western side. Much of that area is a huge marijuana plantation and they don’t want anyone around. We crossed off Chateaubelair from the itinerary, and decided to go straight to Bequia. That is easier said than done, as it’s a long way from Les Pitons to Bequia! The boat briefing occurred next, with the usual issues of figuring out what we were missing, such as a coffee pot. Next was our major provisioning at a very modern and especially clean grocery store that was accessible almost directly by dinghy! With a nice division of effort among the four of us, provisioning went quickly and we were soon at Skoolzout. We finally departed, albeit slightly ungracefully, nearly accidently leaving Tom on the dock. The sails went up, the engine went off, and we enjoyed the peaceful reward for all our scurrying about. It lasted only a while as the winds on the leeward side of St. Lucia were very light, so we were only sailing at about 3 knots. We realized if we were to get to the Pitons before dark we had better motor along. With the engine at 2,000 RPM on a 43-foot Beneteau we were making about 7.2 knots so we arrived off the Pitons at 5 pm, but the best anchorage was already full. Lucius, a local “boat boy,” said there was a mooring in the next bay and that he would help us, but when we actually arrived no moorings were available, so he helped us anchor, taking a sternline ashore in his skiff. We tied a dockline and part of the spare anchor rode together after much untangling of badly hockled lines. The fee for his services was 50 EC. We were all asleep by 9:30 pm. It was a night with much rock and roll, with the shoreline unfortunately keeping us abeam of the ocean swells. We departed for points south at 9:15 am Thursday, only to discover that the main halyard was difficult to hoist even using a winch. Unfortunately, we did not notice that it had wrapped around a deck light on the front of the mast and broken the plastic housing, and was caught on a fragment beyond our reach. Tom was our hero, climbing the only two mast steps in the rolling sea and eventually freeing the halyard using the boat hook at maximum extension. This was a relatively long sailing day – 47 nautical miles to St. Vincent, and then down the island to one of the leeward-side harbors. As we were in the lee of some rather tall mountains, we motorsailed for a while to make up time, then had a really great sail at about nine knots for four hours after we finally broke out of the lee of St. Lucia. When we sailed past the northern portion of St. Vincent, Tom was sure he smelled marijuana from two miles away. Perhaps this sensitivity was the result of a misspent youth? As we approached Wallilabou, which is about halfway down the coast of St. Vincent but still about 1.5 NM away, we encountered a very crude rowing skiff with two men waving their hands in the international distress signal. Of course we slowed to see if they needed help. They said they did, but immediately seemed to want to board! Much shouting ensued. We tried to get away but they rowed quickly, caught the dinghy and leapt in without permission! It seems this is their way to get customers so they can later “help the boat” anchor in Wallilabou. However, anchoring there was unusual and their help actually was useful. Wallilabou harbor, where a portion of Pirates of the Caribbean was filmed, was extremely deep. While backing up to the shore, the anchor initially went down in 60 feet of water, at their suggestion. It quickly grabbed the sloping ledge as we backed in, and one of the fellows took our sternline ashore. This time our spare anchor rode was neatly coiled in the locker and served as a single line to shore. As soon as we were anchored, men selling trinkets, ice, fruit, offering to take the garbage, and asking for food for their children, approached. Children also came by selling trinkets to help their mothers, and on and on. Clearly this is a terribly needy area. On Friday, we had an absolutely wonderful sail all the way to Admiralty Bay on Bequia (pronounced Beck-way). Initially on a close reach in 20-knot easterlies, the wind backed slightly once we were clear of land, so we were soon on a beam reach sailing south. We were soon hitting speeds between 8.8 and 9.2 knots, with a peak of 9.3. Because the sailing was so terrific, we decided to rotate 30-minute turns on the helm so each of us could share the joy! We reached Admiralty Bay, and dropped the anchor in 12 feet of clear water on a beautiful sandy patch. Shortly thereafter we took the dinghy so all four of us could stroll about town. Tom and Lauren chose the restaurant for dinner – The Gingerbread House – and made a reservation for 6:30. Back at the boat, we swam in the beautiful water and Lauren had her first-ever snorkeling adventure. The Gingerbread House was great, although there were only a few other tables occupied. We were all very pleased and ate everything. Dinner was a wonderful treat from the Rankins to say thank you for including them in this remarkable sailing adventure. On Sunday, we were off to Salt Whistle Bay on Mayreau. It was so pretty that we anchored for a bit and then decided to stay because a local Sunsail representative told us where there was a bar with a TV. He had us weigh anchor and drop closer to the beach amid some moored boats. That didn’t look good, but he seemed to know what he was doing and it worked out fine. We all went swimming to cool off. I checked out the Mayreau Resort where we had dined two years before, but sadly it was now closed. The beach here is very beautiful, and although the bay is often a bit crowded with sailboats, catamarans and powerboats, it is surely another of our favorites. At 3:30 pm we took a cab ride up the very long, steep hill. I suspect none of us could have made that walk without gasping! The Island Paradise Bar and Restaurant is just over the hump of the hill with a great view of Saline Bay and the waters beyond. The owner, James Alexander, has done a beautiful job – tile floors, varnished tables, stonework wall decorations, flowered china intentionally but nicely mismatched, with greens for centerpieces. Our dinner was excellent. If you’re ever on Mayreau, we strongly recommend dinner at the Island Paradise! On Monday morning, we motored 2.5 nautical miles to the Tobago Cays with a strong east wind directly on our nose. The anchor went down in 10 feet of amazingly clear water and dug into the sandy bottom. Two sea turtles swam nearby and “smiled.” In the afternoon we took the dinghy to Baradel Island and climbed to the top to see the spectacular view of the water. We later swam off the beach and snorkeled in the turtle sanctuary, where we each had a turtle swim with us for a while. Great fun! Tom was checking out the blond on a nearby catamaran, although he missed seeing her skinny-dipping! The next morning we departed for Bequia. We had another terrific sail, often hitting 9 knots on a beam reach in 18-20 knot easterlies, and headed into beautiful Admiralty Bay yet again. On Wednesday, we were on our way back to St. Lucia. This was to be “the long sail” of about 80 NM from Admiralty Bay to reach a harbor on St. Lucia. 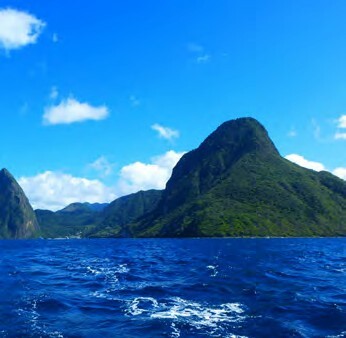 First, because there is not a really good place to stop along the leeward side of St. Vincent, or St. Lucia until Les Pitons, and second, because one must sail across open water from Bequia to St. Vincent, and then from St. Vincent to St. Lucia. To pass time, we tried singing some wonderful old sea shanties but couldn’t remember very many of the lyrics or even many of the tunes! Unfortunately, none of us had brought any sea shanty CDs so we did our best, which was fun but not very melodic. 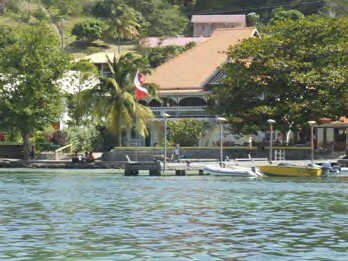 We finally reached Marigot Bay. None of us had been there before. It was a very charming little harbor and anchorage. We did a very slow ‘harbor tour’ on Skoolzout, checked out the marina, the beach resort, and even a sunken ketch. We anchored outside the harbor, away from the mangroves and bugs. Lauren thought this was the prettiest harbor we had been in. We returned to the Sunsail/Moorings base in Rodney Bay on Thursday, and a Moorings employee jumped aboard and expertly backed us in to the exact same slip we’d left eight days before. It was a lovely afternoon and we had plenty of time to read, relax, debrief, start packing and cleanup, shower and then go to dinner. We were all packed and cleaned up by 10 am Friday. Since the cab was to meet us at noon, we opened the last bottle of wine, a red Moscato, and then added the last of the Sprite to create wine coolers. Tom commented that it was amazing how well we could all get along in such a small space for ten days. It was quite true. It was a wonderful trip with some splendid 9+ knot sailing, and we got to visit our beloved Tobago Cays yet again. Tom said it was indeed a fabulous trip, and he and Lauren respond positively and quite happily whenever people ask them how it went. St. Lucia is beautiful, Les Pitons are magnificent, and Marigot Bay is lovely. It’s a very long sail from Les Pitons to Bequia. The harbors along the leeward side of St. Vincent are not particularly inviting. The Island Paradise restaurant on Mayreau is terrific! The Tobago Cays are glorious! Baradel Island not only has sea turtles, but many iguanas. This article is an abridged excerpt from the book Voyages by Nancy Kaull and Paul Jacobs, which is available both in electronic form (for Kindle and Nook) and in paperback through Amazon. As members of the Sunsail owners program, Nancy and Paul, who reside in Saunderstown, RI, have sailed in the Bahamas, the Caribbean, the Mediterranean, and the South Pacific. Special thanks to Daniela Clark at TUI Marine for photographic assistance with this article.